Global Stand-Up Pouch Valves Market size is estimated to exceed USD 900 million by 2024; according to a new research report by Global Market Insights, Inc. Potential applications in retort and shaped pouches to improve product convenience will propel the stand-up pouch valves market growth. Changing food habits and hectic schedules have further increased the necessity for product convenience, thus influencing demand for pouch with spouts. Improved functions including mess free dispensing, easy opening, self-feeding and reseal-ability are among key factors driving industry growth. Shifting consumer preference towards liquid diet due to increasing health consciousness will support stand-up pouch spouts market size. Growing consumer spending on packaged food along with rapid adoption of spouted packaging are other major factors fueling business growth. Technological advancement in packaging machinery enabling spout welding on pouches along with frequent packaging design innovations will further support industry demand. Increasing adoption of less space consuming flexible packaging with fitments among manufacturers to reduce transportation cost will propel product penetration. Strong outlook in several end-use industries including food & beverages and household & personal care industry will drive stand-up pouch spouts market. Improved shelf life, enhanced choke resistance & child safety along with tamper evident packaging are among the key factors driving the product demand. Reduced environmental impact due to low plastic consumption and accommodating more shipment units in less space will support industry growth. High variation in raw material price trends due to fluctuating polymer costs may restrain product demand. Moreover, presence of packaging substitutes with substantial industry share pose a challenge for industry growth. Corner stand-up pouch valves market catered for over 70% of the industry share in 2016. Improved ease in dispensing and enhanced mess free consumption due to convenient pouring position has enhanced the product demand. Moreover, additional fitments including side notches and handles particularly used in industrial application will further support industry growth. Form Fill & Seal technique accounted for over 45% of the global demand in 2016. Highly automated assembly line with multi-purpose functions including valve installation are the key factors driving the industry growth. Technological advancements including computer interfaces and control systems further enhanced the industry demand. Stand-up pouch spouts with aluminum foil market will observe CAGR exceeding 6.5% up to 2024. Enhanced hygiene, air tightness & moisture resistance features preserving flavors and freshness for longer time will drive industry demand. Rising product adoption mainly among household care & personal care companies will propel product scope. Food & beverages applications are expected to grow at over 6.5% up to 2024. High product adoption scope in sauces, baby food and sticky & pasty products are the key factors fueling stand-up pouch spouts market growth. Rising packaged food demand due to growing consumer income will provide positive outlook for industry growth. 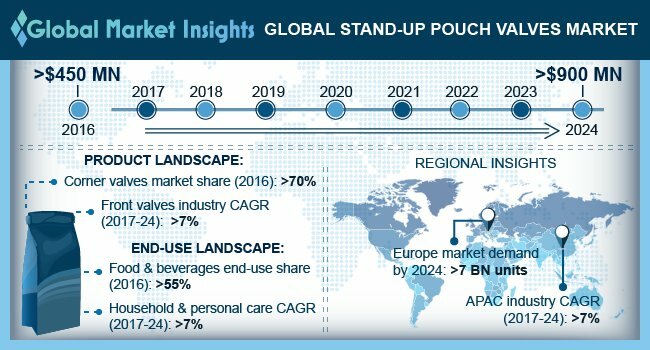 Asia Pacific accounted for more than 35% of the stand-up pouch spouts market share in 2016. Cost-effectiveness and packaging durability are among key factors driving regional demand. Moreover, growth in food & beverages and household care industry will support the product demand. Global stand-up pouch valves market share is highly fragmented owing to the presence of large number of international as well as regional industry players. Scholle IPN, Menshen, Falakpack, Glenroy, Pacificbag, Smurfit Kappa, Liqui-Box, Wilk Group, Swisspack and Gualapack Group are among key industry players. Collaborations and supply agreements with pouch manufacturers along with mergers & acquisitions are major strategies adopted by manufacturers.